Jennifer Lee was born in Virginia, USA on 15 August, 1965, so she will be celebrating her birthday on the day of the first Olympic jumping event at the Hong Kong Olympic Equestrian Venue in Sha Tin. She has lived in Hong Kong with husband Lee Kwok Tung (Sam), a Hong Kong-born Chinese national, since 1994. She has been riding in Hong Kong for the past 13 years and has represented Hong Kong successfully at international level on numerous occasions. Well-known on the Asian competition circuit, she has won team or individual medals for Hong Kong at every competition she has ridden in since 2001. Her medal haul includes gold medals in Taiwan and Hong Kong in 2004, silver in Korea 2006, Thailand 2004 and India 2001 and bronze in Korea 2004 and 2005 and India 2004. She holds the Hong Kong high jump record after clearing a 1.7 metre wall in March 2004 with a retired racehorse that she nursed back from a leg injury and trained to jump – with obvious success. Jennifer has won the Advanced level of the Hong Kong leg of the International Equestrian Federation (FEI) World Jumping Challenge three times, in 2001, 2004 and 2006. 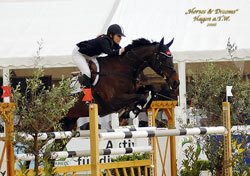 Her 2001 win gave her an overall world ranking of 11th in the FEI World Jumping Challenge. She also won the Advanced section of Hong Kong's FEI World Dressage Challenge in 2004. Jennifer Lee is one of a squad of riders to receive sponsorship from The Hong Kong Jockey Club and The Hong Kong Jockey Club Charities Trust Fund. She is doing pre-Olympic training in Germany with Dietmar Gugler, Jimmy Doyle and Rod Brown.